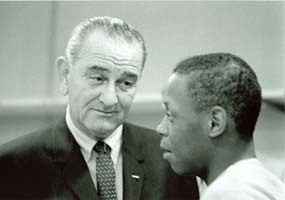 President Lyndon B. Johnson talks to a Job Corps enrollee at Catoctin in 1965. Photo courtesy of NPS. Catoctin Mountain Park is a small national park unit located in Thurmont, Maryland with a very special role—to serve as a buffer for the Presidential Retreat while providing recreational opportunities and protecting the natural environment. Most people do not know that Catoctin also has a long history of land and social reform that has tremendously shaped the park’s landscape over the past seventy-five years. This particular flavor of social reform, known as “human conservation,” is rooted in the Progressive Era and parallels the natural conservation movement that created the national park system. The central idea is that human beings are an important national resource that needs to be carefully managed (like soil, trees, and water) to reach their highest potential. Catoctin tells this story quite well: from the federal government’s displacement of farmers from submarginal land during the Great Depression to create a recreational area, to the establishment of the nation’s first Job Corps Center in 1965. From September 2013 to August 2014, I completed a Special Resource Study on human conservation programs at Catoctin Mountain Park for my public history residency. What is a public history residency? The residency is a key component to Middle Tennessee State University’s doctoral program in public history. It is designed to put candidates in the field for nine to twelve months to develop their professional portfolio as public history practitioners, implement concepts learned in the classroom, develop new skills, and help inform dissertation projects. Residents are responsible for setting up their own projects with a sponsoring organization. They also work with a mentor throughout the duration of the project. I am working with the NPS’s regional historian. This residency was designed to prepare me to consult with federal agencies and train me to write for public audiences. It also contributed to my dissertation research on park development in Appalachia from the New Deal through the Great Society. Update: The National Park Service approved the study in July 2014. Please contact me if you are interested in a copy. About Photo: President Lyndon B. Johnson talks to Job Corps enrollee at Catoctin Job Corps Conservation Center. LBJ’s administration passed the Economic Opportunity Act in 1964, which created the Job Corps program. Catoctin had the very first Job Corps Center in the country. The Job Corps was modeled after the New Deal’s Civilian Conservation Corps, and the Catoctin Job Corps Center was built on the foundations of the old CCC camp in the Round Meadow area of the park.